Capers are the flower buds of the Mediterranean Capparis plant, generally sold preserved in brine, vinegar or oil making them a fantastic store cupboard ingredient. 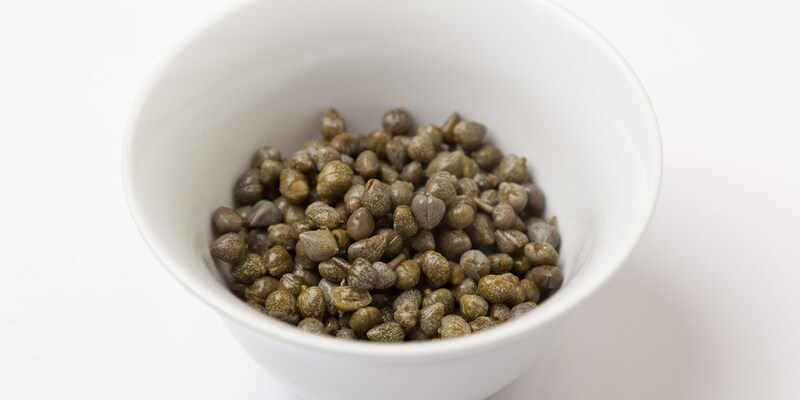 Capers make a welcome addition to any dish – bringing a distinctive salty tang with them – and work particularly well scattered over salads and pizzas as well as providing a superb depth of flavour to pasta sauces and stews. This collection of recipe ideas aims to showcase the wonderful flavour of capers. Mauro Uliassi demonstrates one of the more traditional uses of capers in his variation puttanesca sauce recipe, updating his variation of the classic with prawns and amberjack. The Costardi Brothers also demonstrate that the salty caper is a natural bedfellow to seafood, whizzing them into a powder to be paired with red mullet fillet. For a vegetarian dinner idea try Fabrizio Marino's Italian ramen salad, a pasta salad recipe scattered with capers, olives and a striking cheese cream.